The keyboard is an instrument of great musical range and dynamics. From soothing ballads to pounding grooves, the keyboard provides a solid base to build your musical journey upon. Be amazed by the inherent power of this instrument to move and touch your audience. Find the musician in you and witness the power of song in your life and in the lives of others as you engage in meaningful lyrical exchange. Use songs to speak the thoughts from your heart and soul, this is personal art at its very best. 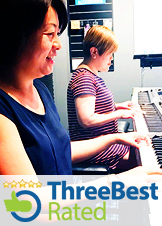 The Contemporary Keyboard Program™ is designed to equip you with the proper techniques to play and sing casually for both individual and social enjoyment. It is never too late to embark on this musical adventure…We will take you there.